1. The Charmings are Pawns in the Past and Present. This week’s flashback is barely worth talking about. The QoD get Snowing to tromp through the woods in order to visit a magic talking wish tree that they all hoped would tell them how to evade Regina’s Dark Curse (aka Storybrooke). But the tree rejected the couple because Baby Charming (aka Emma) has the potential to be seriously Evil. The magic talking wish tree that will only talk to two pure souls, and is afraid of an unborn possible supervillain, is honestly almost too ridiculous even for me. Anyway, in the present Ursula, Cruella, and Rumple manipulate Snowing into lending their blood to resurrect Maleficent. It required their blood because their betrayal of her was the worst ever. Which is both welcome and worrisome. Welcome because at its best this show is about the world of grey these characters live in despite all their talk about heroes and villains. Everyone, even the most pure hearted heroes of all, has both light and dark within and exploring that makes all of the characters more interesting. Worrisome because it lets Regina and theoretically Stefan, and Rumple, and whoever else may be a player in Maleficent’s story off the hook for worst betrayal because the magic says so. 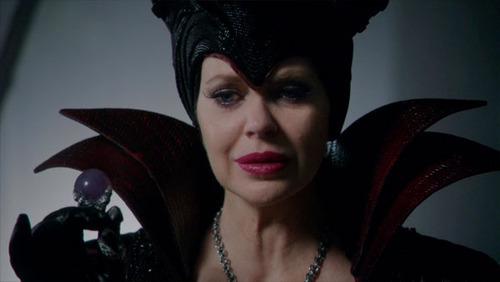 But I will reserve judgement since we haven’t seen the series version of Maleficent’s backstory. 2. Maleficent is Alive, and was Pregnant. Despite Snow’s endless speech, we don’t know much more than: prior to the first curse, Mal was pregnant, and because of something Snow and Charming did she lost the baby. We don’t know when or how or why beyond it being related to protecting their own unborn child. We don’t know who the father is, maybe there isn’t one. We don’t know what happened to the baby though it’s a pretty safe bet she’s Lily. Unless she’s Emma, and Lily is Snowing’s baby, but that seems less likely based on the fact that we’ve seen Emma’s birth. But you know. Who knows. I love that this show is interested in mothers and motherhood. I am scared for yet more “real mother” dramarama. 3. Will and Belle are A Thing. The show really tried to make me sad for Rumple and Rumbelle but I’m only sad that she wasn’t kissing Ruby. 4. Hook and Emma have a Healthy Relationship. Hook and Emma have the most mismanaged relationship on this series. Everything that happened between them in this episode was set up to move Snowing plot forward (or actually backwards) but the result is at the moment they are in a good place. They had an adult conversation about trust and honesty and communication. And they are super adorable. 5. Snow and Regina have a Healthy Relationship? Well, they are moving towards it. After hearing Emma tell Hook that she is opening her heart up to hope, Snow and Charming decide not to explain why they are against (and afraid of) the QoD. 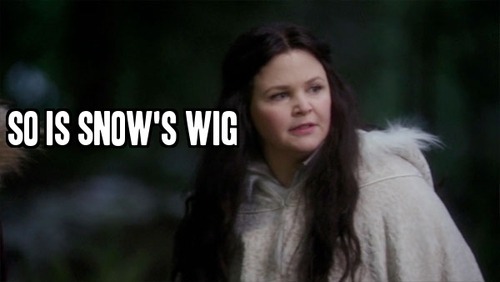 But, especially with Maleficent back in the mix, they need help so Snow invites Regina to the edge of town. After babbling for what feels like three days, Snow confides that something she and Charming did to protect Emma resulted in Maleficent losing her child. To be continued. In Regina’s pointless subplot of the week, they remember that everyone thought August was the Author of the book before it was revealed that he is Pinocchio. So Regina drags Gepetto and BB August into her office and proceeds to yell at the kid about his poor choices in presentation when he was an adult. She also drags Emma in to… have creepy sexual tension because when he was an adult everyone thought they should hook up? I don’t know but it doesn’t work and the kid is traumatized so Gepetto tells Regina to stay away. Later she apologizes and he’s so moved he gives her the saddle bags from August’s bike, where he kept the book when he had the book back in season one and wow, I miss August. So that happened. I found this episode weirdly disjointed, what do you think?